Monday December 16th 1878 It snowed all day long. I did not go over to have my teeth fixed. The girls cut carpet rags all day. Hatt went to town in the evening and I sewed some. 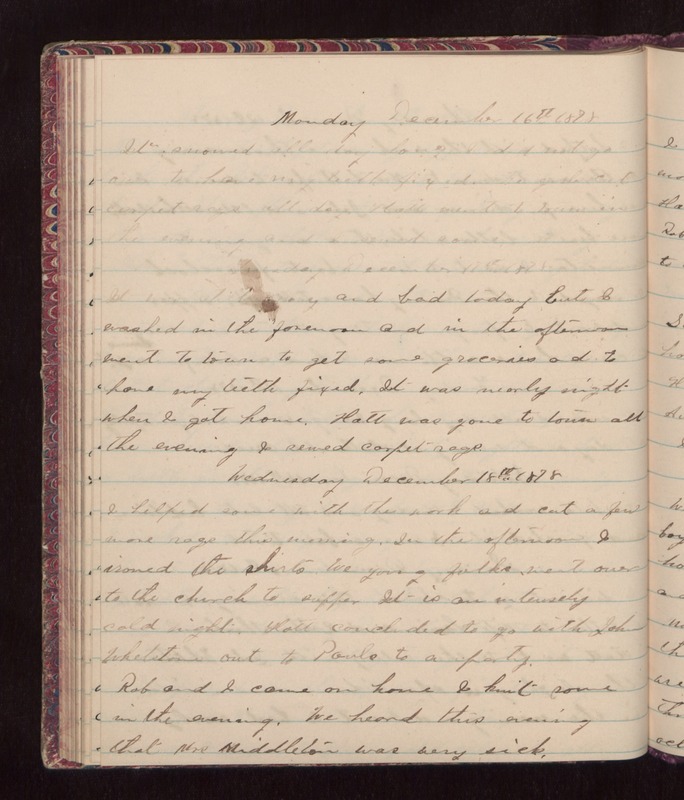 Tuesday December 17th 1878 It was a little snowy and bad today but I washed in the forenoon and in the afternoon went to town to get some groceries and to have my teeth fixed. It was nearly night when I got home. Hatt was gone to town all the evening. I sewed carpet rags. Wednesday December 18th 1878 I helped some with the work and cut a few more rags this morning. In the afternoon I ironed the shirts. We young folks went over to the church to supper. It is an intensely cold night. Hatt concluded to go with John Whetstone out to Pauls to a party. Rob and I came on home I knit some in the evening. We heard this evening that Mrs Middleton was very sick.